After five years at USC Thornton as an adjunct associate professor, Tram Sparks has been named associate professor of practice in the Choral & Sacred Music Program. 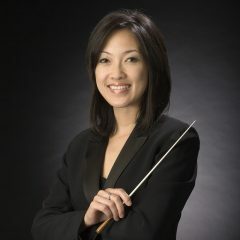 Prior to joining the USC faculty in 2015, Sparks taught for over ten years at Temple University Boyer College of Music & Dance, serving as associate professor and associate director of choral activities. Her career has also included stops at Dordt College and St. Joseph’s University. A native of Vietnam, Sparks holds a doctor of musical arts in choral conducting from Yale University. Her research interests center around two areas and the subtle interplay between them – conducting technique rooted in modern dance theory and a contextual understanding of cheironomy in contemporaneous early communities of worship.